Upset that your Ponies are mooing as Brahmin, or your Giant Lizard Men are making dog noises? This tutorial will show you how to remove those pesky sounds! Not sure what permissions you need for a tutorial. Are you frustrated with the default creature sounds emitting from your custom creatures? 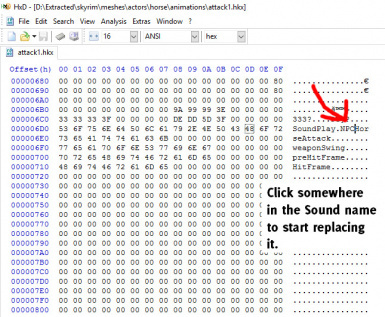 This tutorial will show you how to remove those sounds from the .hkx / .kf animation files using HxD or NIFSkope. **For NIFSkope method: you'll need to convert the .hkx files into .kf before you can continue. **For HxD method: No conversion needed, you'd be editing the file directly. FancyPants: For providing the HxD images and for sharing the information!